Mando maestro Andrew Collins finds himself – through no actual fault of his own – at the epicentre of Canada’s burgeoning acoustic/roots music scene. He didn’t invent it – but he’s certainly been a contributor, having co-founded seriously noteworthy Canadian bands like the Creaking Tree String Quartet, the Foggy Hogtown Boys and, more recently, the Andrew Collins Trio. That’s not to mention the fact that this prolific, robust performer – comfortable on mandolin, fiddle, guitar, mandola and mandocello – composes, produces, arranges, writes and teaches across multiple genres, including a popular collision of bluegrass, folk, blues, jazz, old-time, swing, Celtic and classical. As Collins gathers up innumerable Juno nominations and Canadian Folk Music Awards won by these various ensembles, he’s zeroing in on the work he does with his beloved trio. 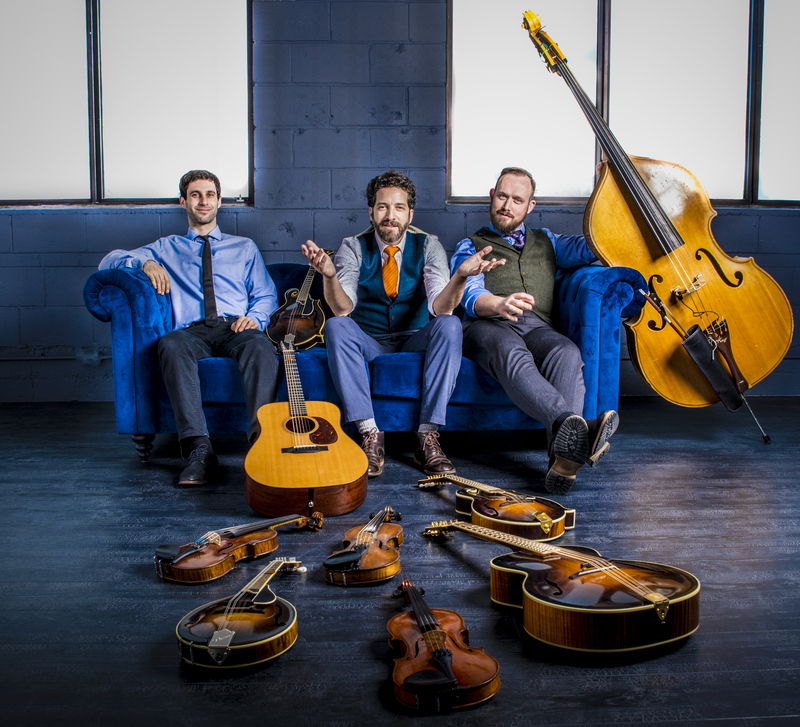 Now joined by fellow string guru, Mike Mezzatesta – who’s versatility and mastery shine through on guitar, mandolin, fiddle and mandola, and in-the-pocket James McEleney, holding it down on the bass, mandocello and vocals. On their newest release, And It Was Good, all three players continue their push into new territory, as they assault the 7 days of Creation, brilliantly rendering each day’s creation story to musical fruition in this new, Chamber Grass disc. And It Was Good IS good – a labour of love inspired by the late Oliver Schroer, if not overseen by his musical specter. The result is a lush-sounding, multi-layered composition bringing fresh meaning to an age-old story while demonstrating the depth of musicianship from each of these three inspirational players. Despite taking musical cues from David Grisman, Andrew, Mike and James have ventured further down this path of Newgrass and beyond – melding multiple genres after absorbing each of their boundaries – all towards extrapolating brave new musical worlds that can only be thought of as their own ‘creation’. Nothing less will do. You won’t be able to put any box around what the ACT does – no matter how hard you try. And that’s the way they like it, on disc and stage. That’s certainly the Andrew Collins Trio’s mission in life – to swing open new doors, towards a reimagining of how we listen and what we listen to.